I'm involved with The Skoda Prize Show, currently on view at the Lalit Kala Akademi. One of the three artists nominated this year, Bangalore's Navin Thomas, has a work on display that uses live pigeons. They sit in a room that's sixteen feet by twelve feet, and are being fed bird food bought from Khan Market. The room's walls are made from cotton mesh that allows fresh air in. The artwork involves sound, white noise emitted by transistors inside the room. At the opening, a few viewers were disturbed by the use of live animals, and the uncomfortably high sound level. Openings are noisy affairs. We have four other pieces in the show which use sound, and the artists who created them wanted their work to be audible to the large number of viewers who came for the inaugural function. 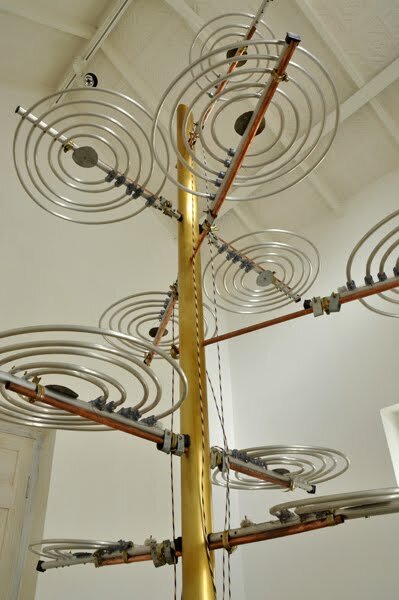 In order for Navin's transistors to be heard above the noise of neighbouring works, he turned the sound up higher than it had been in his solo show at Bangalore's GallerySKE, which I saw a year and a half ago. Once the opening was over, we put all videos on headphones, because henceforth there would rarely be more than two or three people wanting to see a given video at the same time. Navin then turned the volume inside the bird room down to a level perfectly comfortable to human ears. Even during the two and a half hours of the opening, however, there was no indication whatsoever that the pigeons were in any discomfort. The door to the room was open for minutes on end, and none of the pigeons bothered to hop out. They sat on Navin's copper-wire aerials or pecked at their Khan Market food. Many viewers, though, were less interested in observing the pigeons' behaviour than to drawing conclusions based on anthropocentric assumptions. One of these, clearly, was Isha Manchanda of Hindustan Times. She's published a piece in today's paper headlined 'Artiste in soup for confining pigeons'. The truth is that Navin Thomas (who is an 'artist' not an 'artiste') is not in any soup, but Isha Manchanda clearly wants him to be in one. I spoke to her and it was evident she's an extremist who will not listen to reason: the animal-rights equivalent of those wanting to persecute Salman Rushdie and M F Husain. Manchanda has interviewed Navin, and four (count 'em) animal rights activists. None of these activists has seen the way the birds are actually exhibited, but that has never stopped ideologues from drawing conclusions. There is one point made in the article that might have got the Skoda Prize Show in a spot of bother. This is the assertion by members of the Animal Welfare Board that permission from the Board was required before we could exhibit Navin's birds. Manchanda, however, has substituted a quote from a person who knows nothing about the show for basic research. I just looked at the Prevention of Cruelty to Animals Act, and scrutinised with care the section which deals with exhibition of animals. The relevant paragraph (Chapter V, Clause 21) states: “Exhibit” and “train” defined : In this Chapter, " exhibit" means exhibit or any entertainment to which the public are admitted through sale of tickets, and "train" means train for the purpose of any such exhibition, and the expressions "exhibitor" and "trainer" have respectively the corresponding meanings." The Skoda Prize Show does not fall into the category of 'exhibit' as defined by the Act. There are no tickets sold, it is not a show mounted for profit in the manner of, say, a circus. It is free to view in a public gallery. Ergo we did not and do not need any permission from the Animal Welfare Board. Hopefully, this manufactured controversy will end right here, viewers will continue to appreciate the many excellent works on view at Lalit Kala Akademi, and the Hindustan Times will pull up its staff for bad research and dreadful language skills (an 'artiste' is , 'A skilled public performer or entertainer, especially a singer or dancer' ). Probably just a typo, Girish. I read the piece in the published version, in the Mumbai edition. It says 'artist', not 'artiste'. I have to say I was most uncomfortable with the idea of pigeons being confined in a room, that too with continuous (white) noise. And no, I haven't seen it for myself yet. Even if I had, and noticed nothing unusual in the pigeons' behaviour, I would still be uncomfortable with it. And finding a way around a clause is well... little more than a way around. It isn't quite in the spirit of things, is it. As for equating Manchanda to those wanting to persecute Rushdie... wait a second! Whatever happened to respecting another point of view. I have no attachment to her or the piece, but I find it strange that you can so easily and independently align yourself to another cause/ controversy. A little like people equating Anna to Gandhi. I haven't seen the exhibition but I too am completely uncomfortable with the idea of birds in a room with a background of continuous noise. I do happen to know Isha Manchanda pretty well and I have to say this about her, she's not the sort to get agitated about silly things or to manufacture controversy. I'm surprised that the issues that were raised didn't occur to the artist. And to pay so much attention to the typos is an admission that the piece does bring up valid points. Poosha, Utterflea, all you say is that the piece makes you uncomfortable. That's not an argument. A lot of art makes a lot of people uncomfortable. The Satanic Verses made many Muslims uncomfortable. Husain's paintings made many Hindus uncomfortable. I respect your point of view, and Isha's. If you feel uncomfortable, stay away from the show. But she clearly wanted the show to be shut down, and I can't respect that. We are not trying to find our way around a clause. Isha Manchanda is trying to evoke a clause to close down a show when there is no cruelty of any sort involved in Navin's work. I'm surprised you don't see who the aggressor is in this case. Those who want to stifle Navin's creative expression without offering coherent reasons are precisely like those who condemn Husain and Rushdie. The only difference is that animal rights fascists come from rich backgrounds, and are therefore taken seriously by the English media, while those who want to persecute the Husains and Rushdies of the world are not part of the chatterati and can safely be looked down upon. My main grouse against the article was not the typo, but the lack of basic research about the Prevention of Cruelty to Animals Act and what constitutes cruelty in the first place. The writer has also made simple errors in the way she describes sounds emanating from the transistor. Navin has thought carefully about the issues, and knows more about the way birds and insects perceive the world than Isha Manchanda or those who feel 'uncomfortable' but can't say why. Your discomfort simply isn't a good reason to censor art, I'm afraid. The Skoda Prize would never condone any cruelty to animals. The fact is that this piece is not cruel. I was in the gallery again this morning, and again the birds were sitting peacefully in the room even though the door was open for a good half hour. I was afraid a bird might wander out and we'd have to catch it, but they're content to stay within the space. The only reason why I am only able to say that I feel uncomfortable is because I lack the knowledge to state with certainty why something like this would be cruel to the birds. Surely it's not hard to see where the concern is coming from?! If Navin 'has thought carefully about the issues, and knows more about the way birds and insects perceive the world', then perhaps there should have been an accompanying note along with the exhibition. Did he not foresee such a reaction, when he chose to use birds for an installation? Did nobody at Skoda Prize, (or whatever this is a part of)? Or a response/ comment to Manchanda at the very least. She mentions that he refused to comment. I don't remember mentioning censorship of art, in fact am staunchly it. To tell you the truth, I'm a little offended by the insinuation in your response. And I do reserve the right to voice my opinion, thank you very much. Poosha, Navin, a person from his gallery and I all spoke to isha Manchanda. I can assure you I have not come across a more unprofessional interviewer. Navin spoke to her *at length*, very calmly, taking her through all the issues involved. But she wasn't interested in any of it. She'd made her mind up already. There's a place for opinion in newspapers, but reportage is something different. To say an artist is in trouble when actually you wish he was in trouble and you're doing your darndest to ensure he gets into trouble is not ethical journalism in my book. You, I see, have chosen not to address any of this, nor her lack of basic research. How tough is it to read the provisions of the Prevention of Animal Cruelty Act? I visited 'Town's End' in Bangalore and did not witness any cruelty to animals. I did spend time 'observing' the birds and the suggestion that they have been traumatized in the exhibition is, well, laughable. Animal rights activists need to focus on the 'real' work that lies ahead of them and should refrain from finding problems and controversies when none exist.